Home Lifestyle	Unfinished Basement Progress and Pics! Unfinished Basement Progress and Pics! Hey remember that renovation project we started oh, 3 months ago? Well guess what? We aren’t done yet! I’ve been sitting on my hands waiting to share pictures of the progress because it isn’t finished, but the truth is, it might be a while. Granted the hired help is gone so we have come a long way baby. But the rest is up to us and basically, we’re slow. I didn’t feel it right to continue depriving you due to our lack of focus, so I am sharing what we have so far. Originally, this was to be the music room and guest room, and it still is. 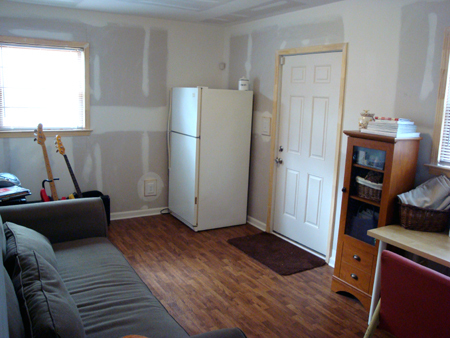 But now it is also a craft room and the only place we could put the extra fridge room. I have shortened that to the hobby room. Let’s begin with a reminder of where we started. Ahh yes the unfinished portion of the basement. Scary cinder blocks, cement floor and all. We started by adding drywall, a few more electrical sockets and lighting. 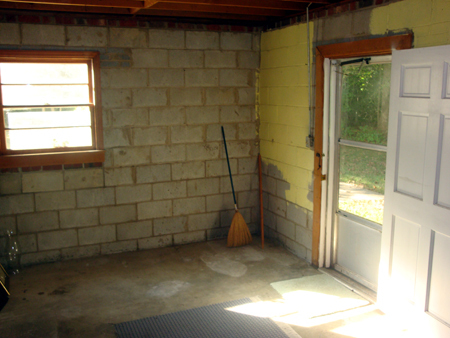 We also removed the rickety screen door and replaced the back door. Opposite view. This corner shows the ‘laundry area’ which is now an actual laundry room! 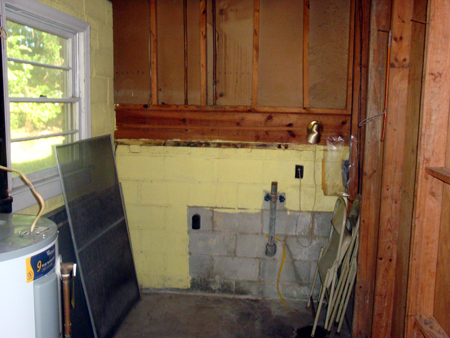 We built a closet around the water heater and replaced the window in the ‘laundry room’ (which coincidentally, was the window the burglars climbed through – good riddance). Ohhh! Ahhh! We have a room! Note the lack of paint on the walls. See, that is our job, which is why it still isn’t done. 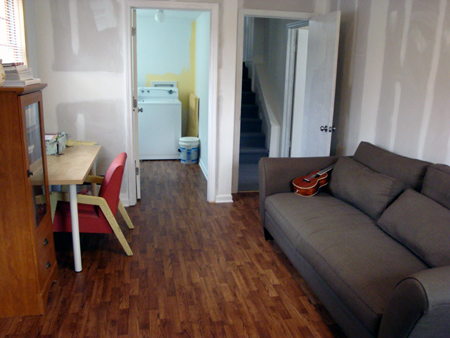 But, we decided to go ahead and set it up because we need the space and furniture is just as easy to move as boxes. Plus, we can use it! This is the Music/Beer portion of the room. We decided to keep the old fridge because now Jerry’s lifelong dream of having a keg-orator in the basement can be fulfilled. Also, I get the freezer all to myself, so look out Sam’s Club! I’d also like to introduce you to our $125 Craigslist couch! Originally from Crate and Barrel (we’re told), Those pillows come off and there is no back so it’s a twin bed. Guest room! What’s this!!? Ladies and gentlemen, this is MY DESK. My very own desk that I don’t have to share with anyone. 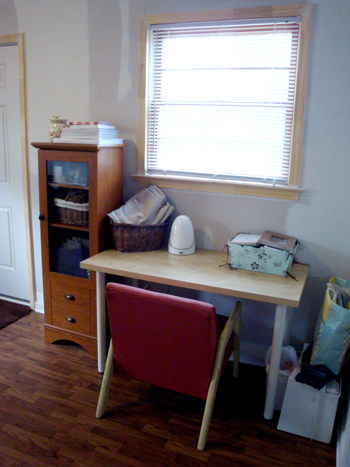 It has my stuff and my pretty magazines and my crafts and my sewing machine and my piles. This is the craft side of the room and also, the can you fix this tear in my pants (?) part of the room. Sewing projects currently in the queue include but are not limited to 2 crafts and 3 repairs. Finally, here is a view back into the rest of the house! Bonus: Sneak peek at the laundry room color!! Also, how do you like the floors? We were on a budget so these babies are straight up sheet vinyl! I was really surprised with how well they turned out. Plus, if our washer decides to overflow (as it sometimes does) we don’t have to worry about damage. Score. So there you have it! Our work of progress in progress! Can you guess the paint color? The only hint I will give is that it’s totally out of my comfort zone but I think I am really going to love it! Honestly, if you can’t have fun in a hobby room, what is the point? And that is one heck of a nice basement! Look at all of that beautiful natural light!!! It looks great so far! What color are you thinking of painting? Andrea, I can so relate! 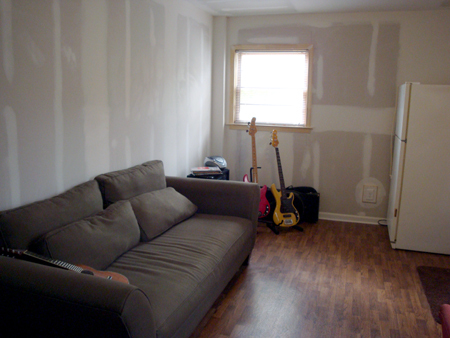 We have an unfinished basement we’d like to turn into a music studio/great room/play room/guest room! Some pro work (I hear drywall is dirty work you should hire out & some do it ourselves). I had vinyl faux hard wood floors in one of my homes and always had so many compliments. It was easy to care for and made a great impression – when you’re on a budget, it really works, I think you’ll love it. And I laughed at your ‘intro’ to your Craigslist couch – but it’s wonderful. Dual purpose is always the way to go. Keep up the great work. I’m showing my hubby and hoping for mutual motivation! i miss the scary basement. also, nice basses! which reminds me: we need to call it the “BASSment”. get it??? b/c of all the bass guitars down there! It’s looking great! And SCORE on the couch! I love it! It’s so funny when I look at it and think oh how I wish I could go there and help her do it. I think someone needs to slap my hand and tell me that I need to stick to my own unfinished projects. LOL! I’m positive you will be so happy when you are done. Keep posting updates. I want to re-do my downstairs so bad! I love the way yours is looking so far- can’t wait to see the finished room! 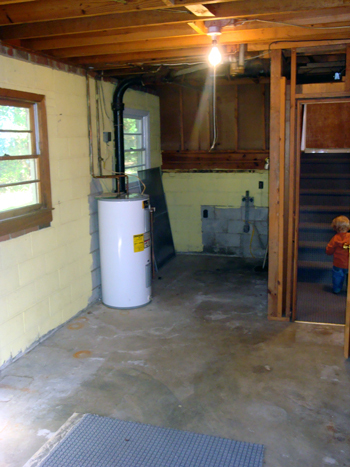 Very amazing post by author on Unfinished Basement Progress and Pics!